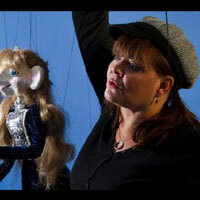 Heather Nisbett- Loewenstein is the Founder, Artistic Director, and a Company Puppeteer of StoneLion Puppet Theatre in Kansas City, Missouri. She has performed, designed, and/or directed more than 70 different productions for StoneLion, and works as a puppet builder and costume designer for professional theaters. Heather has also been a Kansas City Art Institute Continuing Education Teacher and taught Puppetry and Costume at Kansas City Kansas Community College. She holds a Bachelor of Theater Arts degree from Boise State University and earned a Certificate of Theatre at the University of Dublin, Trinity College.